Wish you had a way to create your own menu boards? Want to design and decorate your menu boards with ARTISTIC FLARE? Maybe you are NOT READY for entirely new custom menu boards yet. You just want to add a some beautiful artwork to your CURRENT menu boards to make them POP and breathe new life into them. We now offer the opportunity for you to choose ‘a la Carte’ from our selection of hand-painted food graphics so that you can decorate our own menu boards your way. See our Food Artwork Menu Galleries below. Want a BUDGET FRIENDLY way to give your menu boards a whole new look? Go through the Food Art Menu Galleries and choose as many or as few as you’d like. They add rich color, dimension, and visual interest. Each one has been HAND-PAINTED by a professional artist and then printed onto lush, glossy vinyl. Our customers are always surprised at how great they look in real life AND how their sales are impacted immediately. Click here if you are more interested in all new CUSTOM MENU BOARDS. Want a FAST & EASY WAY to transform your menu boards? Your new menu board food graphics will arrive ready to put on your menu board and totally change the look in moments. They are LIGHTWEIGHT, CLEANABLE and DURABLE. Each is printed onto GLOSSY, TOP QUALITY vinyl and mounted onto a 1/4″ black substrate. Our painted food art can be easily hung with your choice of either Velcro, glue gun, small brad nails, OR double-sided tape. You could also attach magnets if you have a magnetic menu board… Put them ONTO or AROUND your menu boards to focus your customers’ attention to items you’d like to promote. Want menu board art that you can use OUTSIDE? Want to support products MADE IN THE USA? We are a small, local business in the Pennsylvania mountains. We personally create everything here is the United States and take pride in our country, craft AND customer care. Click below to see our gorgeous selection of hand-painted food art for your menu boards. Check back often - more art work is added all the time. Please allow about 3 weeks for delivery because everything is made to order. 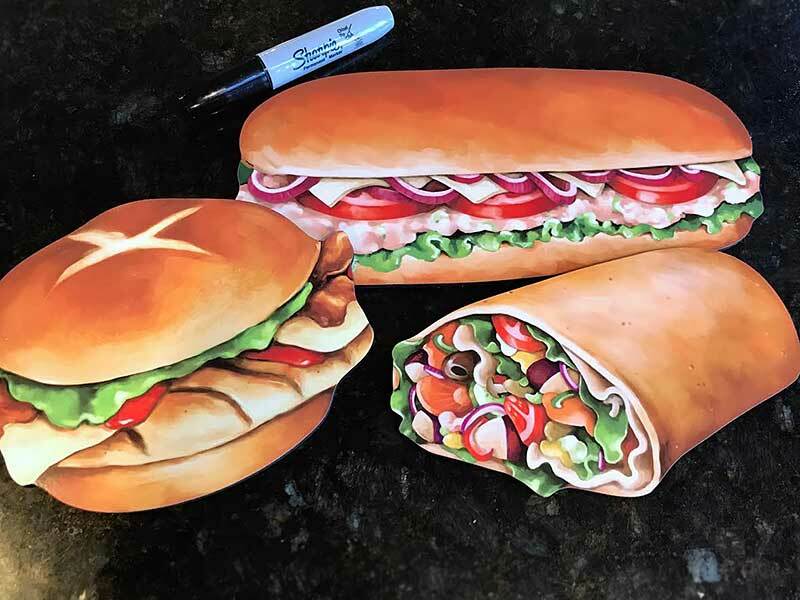 Each menu board food art piece is hand-painted before being printed onto premium vinyl with a lush, glossy finish that is cleanable and will not fade. They are mounted onto a durable 1/4″ black PVC substrate and individually cut-out by hand. They are easily attached to your menu boards with velcro or small brad nails. Custom painting and different sizes available upon request. I just got my package of graphics that I ordered from your company. I AM SHOCKED! I can’t believe what I paid for this product! YOU ARE WAY TOO GOOD A BARGAIN! Everything is more beautiful than I expected. Such great quality, I never thought they would look this great. I don’t know if I missed it on your web page, but couldn’t tell what signs were made out of. I thought they would be on a heavy cardboard. I was so delighted to see how well they are made. I plan to purchase more, I will keep checking back to see what you have listed. Now remember…if you raise your prices (my suggestion) I should still get the “family discount” lol. Thanks so much. Keep up the good/make that GREAT work!!!"